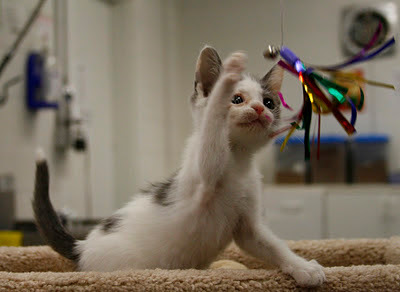 One way you can help homeless animals is to play with the cats at your local shelter. Do you love animals? Would you like to volunteer to help homeless pets but are not sure how to get involved? PetSmart Charities® is introducing Volunteer Action Day today to bring awareness about the volunteer needs of animal welfare organizations and to encourage you to help homeless pets by volunteering your talents in your community. Click here to see how volunteers help animal rescue organizations. I volunteer at the Jersey Animal Coalition as a cat socializer. When I walk into the cattery at the shelter, I see so many kitties who deserve forever homes. It is very satisfying to be able to spend time with the cats and most importantly provide them with love and affection and some enjoyable playtime. How rewarding it is to hear the kitties purr. Easy to Volunteer: Start by Entering Your Zip Code. People Saving Pets™ empowered by PetSmart Charities has made it easy for you to find numerous volunteer opportunities in your community--whether it's fostering a dog, playing with kittens or working as a website game programmer. Enter your zip code here at the People Saving Pets site and find out how you can volunteer at your local rescue organization. You'll make a huge difference in an animal's life. What a wonderful idea :) What human would not want to spend time with furry little kitties and give them love :) Great post!!!! What a great post! Thanks yous! I want to be sure my Museum readers see this! That is a wonderful thing to do, any day or every day!